HOUSTON, Nov. 14, 2018 /PRNewswire/ — Mineral and royalty buyers focused on premium shale basins now have the opportunity to acquire hundreds of net mineral acres in the core of the Delaware Basin. Private sellers have retained Shale Marketplace to solicit offers for 200 net mineral acres of producing and non-producing minerals in Eddy County, New Mexico. The acreage is located just north of where Loving, Reeves, and Culberson Counties all meet on the Texas side of the state line, in the heart of the area that fetched record prices during the September 2018 BLM lease sale. 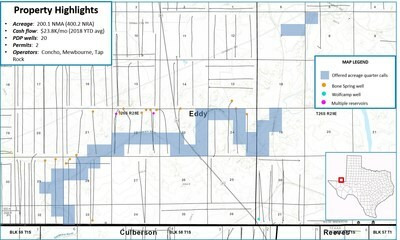 This acreage package represents a unique opportunity for a successful buyer to not only acquire a substantial minerals position in the core of the Delaware Basin but also potentially acquire leasehold interest in the same acreage. Up to 35.5469 NMA will become open as to all depths and up to 150.9088 NMA will become open as to all Wolfcamp depths if wells have not been spud by the end of the primary term ending on January 1, 2020. Open acreage could prove especially valuable, as a portion of the offered acreage that could become open as to all depths lies within sections recently leased at the September 2018 BLM auction at near-record prices. In the event the primary term of the oil and gas lease does expire, a potential buyer will have the ability to either re-lease the acreage at very attractive lease bonuses or participate as a non-operated working interest owner in future development. Materials relating to the acreage package are now available from Shale Marketplace. In order to obtain information regarding the acreage package, please email info@shalemarketplace.com. Offers are due by noon Central Time on Friday, December 21, 2018. Shale Marketplace sources exclusive listings from mineral and royalty owners motivated to get a fair price for their interests in some of the hottest shale plays in the United States and makes them available for review by reputable buyers. New listings are added regularly. Shale Marketplace currently features listings in the Permian Basin’s Delaware and Midland Basins, the Bakken, the Eagle Ford and the Powder River Basin. For more information on Shale Marketplace’s listings and buyer and seller resources, visit https://shalemarketplace.com.